Reminder: Our Blog Has Moved! I just wanted to remind anyone who is still visiting this blog that we’ve begun publishing all new content at our new website: clifonline.org. You can find the blog here. 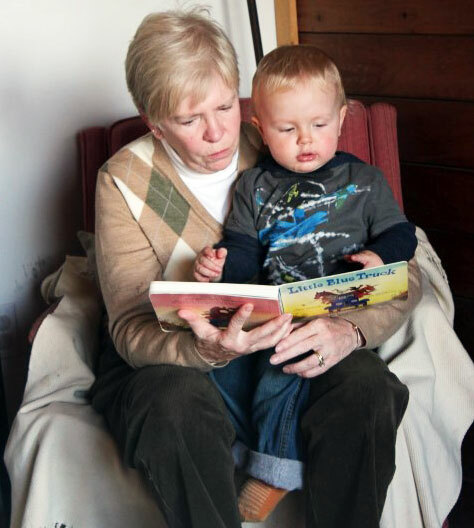 Please join us and join in the conversation about reading aloud with children, book recommendations, funny stories about parenting, and the important work CLiF does in New Hampshire and Vermont. Please Visit Our Blog at Our New Home! Hello everyone! 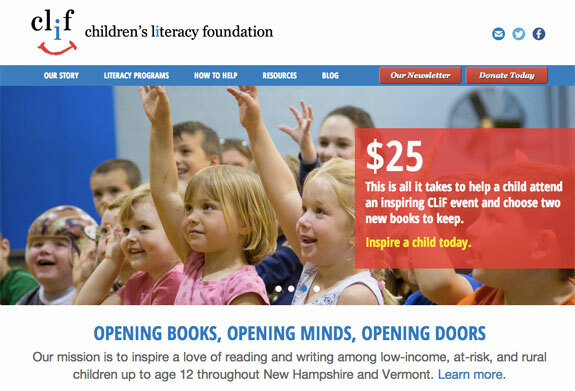 All of us here at CLiF appreciate you following us and encouraging us over the past several months as we’ve tried our hand at writing about the world of the Children’s Literacy Foundation and the children in our lives. After several months of work, CLiF has a new home online at clifonline.org. That’s where you’ll find our blog, including a few new posts! Please join us! We would love to see you there. And let me know if you have any questions. I’m here to help. I can’t imagine how this is possible. My sugar-hyped children have fallen asleep. Thank God. I look around the house. Some dishes from dinner are still on the counter; we barely gobbled it down before heading out to Trick or Treat. The table is covered in neatly sorted piles of peanut butter cups, Smarties, and Mike and Ike’s, all set out and ready for the breakfast rush. The couch and living room are strewn with costume parts and candy wrappers. I am wearing a red union suit, the base layer of one ridiculous clown costume. Plus, I can’t quite get the red lipstick hearts off of my cheeks. Will anyone miss this package of Twizzlers? And I have a blog article to write. Something to do with literacy. I push the costume parts aside and pull my computer onto my lap. Usually, by the time I sit down to write, I have a whole post all worked out in my head. But this week, it was all I could do to get through today. The sugar pulsing through my brain has rendered me numb. All I can think about is how grateful I am for the public education system, which will take my exhausted but candy-fueled children off of my hands tomorrow. I have sucessfully removed all of the dark chocolate from the kids’ stash and squirreled it away where only I can find it. Post-sugar low. A few blog post ideas considered and rejected. 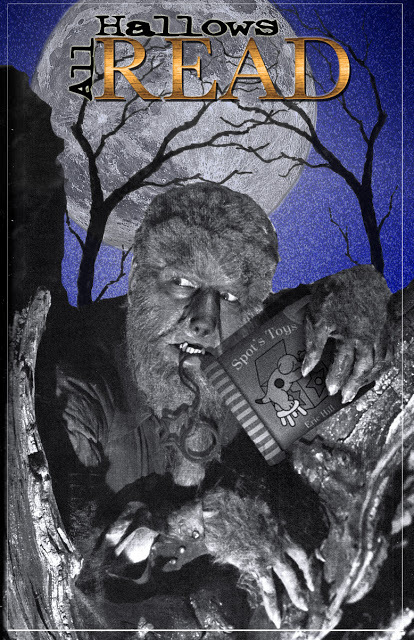 Halloween makes me dumb. Must…go…to…sleep. The Day After Halloween 8:30 a.m.
They’re gone. I can’t believe it. They are finally gone. Plus, I spilled my coffee tripping over my very own clown shoes that I left in the middle of the living room last night. If the kids are affected the same way I am, then good luck teachers. It looks like our nation’s children will be taking a day off from learning. I hope it doesn’t set them back as much as summer. The Day After Halloween 8:45 a.m. Conclusion: Halloween and education are not friends. Frankly, I don’t know why we allow it. 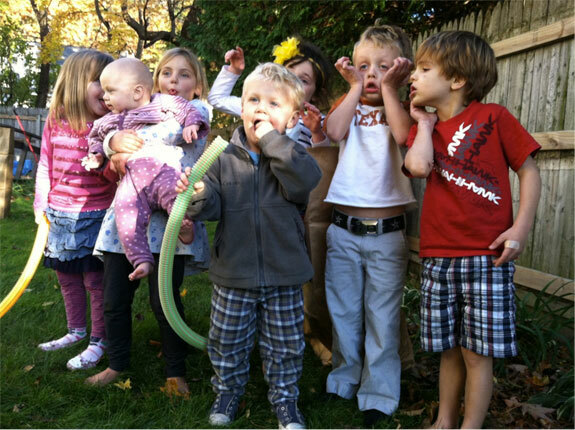 After the daily grind of whole foods, homework, and responsibility a once-annual candy carnage is really fun! Even if it does make us dumb. Temporarily. Consider this new campaign from author Neil Gaiman – All Hallows Read. Neil advises in addition to giving candy this time of year, you should also give books. Scary ones. He makes it easy for us all by provide a trove of booklists on his website. You can also watch the video below, in which he make a compelling argument for sharing books this time of year (while presumably ignoring the grisly crime going on behind him…). Do you see these beautiful children? Oh, they are a handful! In between breaking up fights, encouraging kindness, bandaging rope burn (from the laundry basket incident), and laughing at knock-knock jokes, I feel I should also try to keep the house from becoming rancid, provide fresh healthy meals, check the batteries in the fire alarm, volunteer at school, de-clutter my home, walk off five pounds, and make Halloween-themed cake pops (those last three invaded my head while I waited patiently in the check out line at the grocery store). Oh. And then beat myself up a little bit for being slightly overwhelmed. Sometimes I get the feeling that this is something that our generation is doing to ourselves. This feeling is exacerbated by some women of my mom’s generation (not naming any names, Mom) who tend to imply that when they were at this stage in their lives they had everything well in hand. They were as cool as cucumbers. When I hear this, I think, “Really?” Oh, what am I doing wrong? But not anymore! I just rediscovered the BEST writing on family and parenting ever!! And, even better, the author is a contemporary of my mother’s. It goes to show that parents in the seventies were not as cool as cucumbers: they only remember it that way now that their kids are all out of the house and they are re-accustomed to the calm. So much so that they can’t remember the storm. Thank you Erma Bombeck for showing up in my life today! Thank you for reminding me that the highs and lows of parenting – the joy, laughter, frustration, mess and heartbreak – are all natural and normal, and timeless. Thank you for reminding me that my generation is a part of a long line of parents doing their best and making some mistakes along the way. And thank you for making me laugh at the whole thing. It’s like a balm on my busy soul. And then, because you are a much better writer than me, I will let you take it from here. 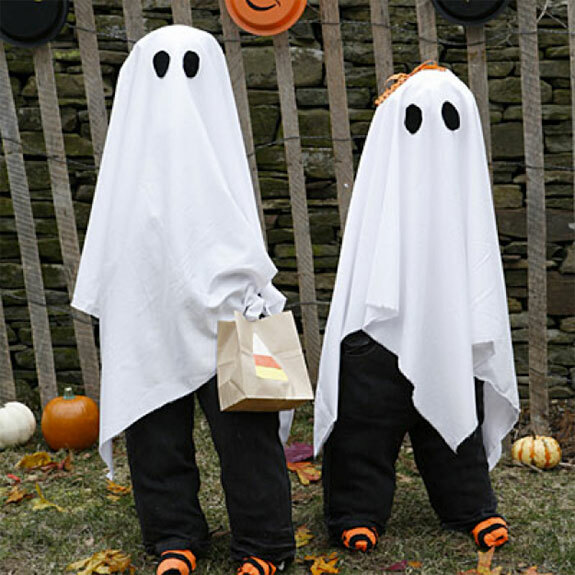 At Halloween I just put brown grocery bags over the kids’ heads, cut two eyes in them, and told them to tell everyone their mother was having surgery. If it hadn’t been for neighbors, I’d have flunked my ink blot tests years ago! THE LOOK OF DEATH: This is used on a child with a busy finger up his nose. (It is similar to the Frozen Stare usually employed to catch a waiter’s eye, but is somewhat different.) It’s a steady gaze, unflinching and unyielding. The brow is furrowed, the lips are firm with no trace of a smile. The face remains in a hypnotic state until the finger is removed from the nose. I began to think about motherhood. There seemed to be several avenues open to me: a) take myself seriously and end up drinking gin right after the school bus left; b) take the children seriously and end up drinking gin BEFORE the school bus left; c) admit to the fear and frustration and have a good time with it. All mothers have their favorite child. It is always the same one, the one who needs you at the moment for whatever reason – to cling to, to shout at, to hurt, to hug, to flatter, to reverse charges to, to unload on, to use – but mostly, to be there. For those of you who aren’t familiar with Erma, she was a humorist and syndicated columnist who wrote from 1965 to her death in 1996. In between she generated some of the funniest and wisest articles about family to be found anywhere. She has many books, but I recommend Forever Erma which is a collection of her columns published after her death. Each column is short enough to read in between band aids and knock knocks and meaningful enough to be worth your while. Suzanne Loring’s mother and Suzanne’s son, Tucker. Sure, there are those beautiful fall days with high, clear blue skies that set off the colors of the trees and just make your heart sing. Roald Dahl would be wasted on those days. And anyway, if we have any of those days left, PUT YOUR BOOKS DOWN AND GO OUTSIDE! When I mention Roald Dahl in the fall, I am talking about the days when the dry leaves swirl up into the air and the wind whistles at the windows. When darkness comes much earlier than you hoped and a chill gets in your bones. If you feel the impending sense of doom that is the coming of winter, that is the time to pull out Roald Dahl. Roald Dahl is the master of the dark and disturbing. His stories for children (and their parents) combine an amazing sense of humor – think Charlie and the Chocolate Factory – and an uncanny knack for facing childhood fears head on. He is quirky, creepy, silly, scary, wry, righteous, and at all times, brilliant. Today, dark clouds hung overhead all day. It was so gloomy. A perfect day for Matilda. Matilda battles gloom with a perky goodness that belies her situation as she contends with Ms. Trunchbull, the evil headmistress of Crunchem Hall School. There is nothing like a brave heroine in a truly terrible situation. The gloom outside helps heighten the mood, and then the book itself raises your spirits and leaves you cheering. I could have used a spot of that today! If I am lucky, thunder and lightning will boom overhead and I won’t be able to put it down. A slightly less scary story is James and the Giant Peach. This story of the boy who escapes from his evil aunts, Spiker and Sponge, is filled with good friends and funny personalities. But there are some terrifying mishaps along the way, and, of course, the constant sense of foreboding surrounding the reappearance of the aunts. It’s still Roald Dahl, after all. 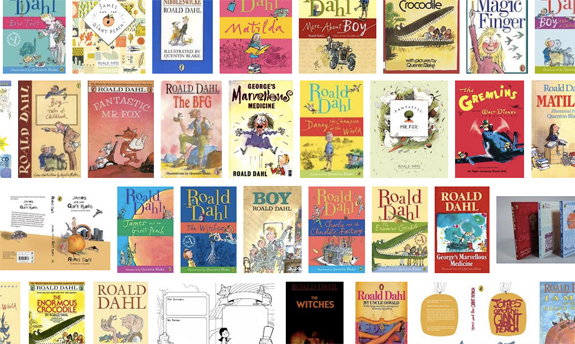 Dahl has a knack for creating child heroines that you love with tenderness; orphans, the lonely, the neglected, and the scared. He pairs them up with someone they (and you) can trust, and then challenges them to overcome their fears. Though the antagonists are certainly creepy, imposing and always absurd, you can rest assured that good will prevail, and a child will find his true strength in the process. Of course, Dahl doesn’t need any help setting the mood. He is an expert at foreboding, after all. But if you read him on these darkening days of fall you meet him half way and its all the more fun.